It was a few days before Halloween and we walked in to find a murder scene in our shop! AAARRHHHH!!! Ok…. not really, but it feels that way when you look at the mess that’s left over from carving pumpkins! No matter how hard you try to contain it (like a Dexter episode) that slime gets everywhere! Here are a few #DuraShineTips to help you contain your pumpkin massacre. 1. Use newspaper or cut open a large garbage bag and lay it flat onto your working surface. When you are finished carving all you need to do is roll/fold up the mess! Using garbage bags is nice because they prevent the “pumpkin guts” from seeping through and dirtying your workspace. However, newspaper is the “green” approach. When you’re finished you can just toss the entire mess into your green bin! 2. Keep a trash bag near each carver. This will limit the amount of walking to and from the trash can which, in turn, limits the amount of pumpkin spill accidents! 3. If you live somewhere rural or have a composter you can dispose of your guts outside, they make great compost or even a snack for the wildlife in our area. If spreading the guts outside isn’t an option and you don’t want the smell to knock you out before trash day, make sure to place your guts in a trash bag and tie it in a knot. And may the force be with you! Extra Tip: Keep your kids entertained by hand them a pile of guts and have them pick out the seeds. Make a game out of it and see who can get the most clean seeds out! Once your kids have successfully picked out the pumpkin seeds, take them to the sink and rinse them off and follow the recipe below for some yummy pumpkin seeds. -Have a safe and happy Halloween from everyone one here at Dura-Shine Clean! 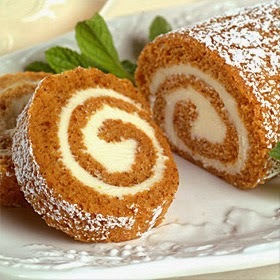 Fall is here, and this month's recipe combines pumpkin and cream cheese all rolled into a wonderful dessert. Enjoy! Heat oven to 375°F. Grease 15x10x1-inch jelly-roll pan; line with parchment or waxed paper. Grease and flour paper; set aside. Arrange clean thin, cotton kitchen towel on counter; sprinkle with powdered sugar. Combine flour, baking powder, baking soda, cinnamon, cloves, and salt in small bowl. Combine eggs and sugar in large bowl; beat until thickened. Add pumpkin; beat until well mixed. Stir in flour mixture. Spread batter evenly into prepared pan. Sprinkle with walnuts, if desired. Bake for 13 to 15 minutes or until center springs back when lightly touched. Immediately loosen cake from edges of pan; invert onto prepared towel. Remove pan; carefully peel off paper. Roll up cake in towel while hot, starting with 10-inch side. Cool completely on wire rack. Beat cream cheese, 1 cup powdered sugar, softened butter and vanilla in small bowl until smooth. Carefully unroll cake; remove towel. Spread cream cheese mixture over cake. Reroll cake. Wrap in plastic food wrap; refrigerate at least one hour. Sprinkle with powdered sugar before serving, if desired. Dura-Shine Clean, LLC is a full-service cleaning company celebrating 20 years in the cleaning industry. Founded in 1993 and based out of Pasco, Washington, Dura-Shine Clean offers superior commercial and residential cleaning to Eastern Washington. Dura-Shine Clean provides commercial janitorial services, floor care, window cleaning, residential, carpet cleaning, and event and construction cleanup. In addition, Dura-Shine Clean provides janitorial services for specialized businesses such as healthcare and industrial facilities. For more information visit www.dura-shineclean.com or contact us at 866.625.7647.